The Lord's Supper is offered at this church in the belief and clad confidence that as He says, our Lord gives into our mouths not only bread and wine but His very body and blood to eat and to drink for the forgiveness of our sins and to strengthen our union with HIm and with one another. Our Lord invites to His table baptized Christians who trust in His Word, are repentant of their sins and set aside any refusal to forgive others. In the Bible God directs that, "a man out to examine himself before he eats of the bread and drinks of the cup," and warns that "whoever eats the bread or drinks the cup of the Lord in an unworthy manner will be guity of sinning against the body and blood of the Lord" (1 Corinthians 11:27,28). Therefore, if you have not been baptized or has not been instructed in the reception of the Lord's Supper, we recommend that you do not take it at this time, but ask to meet with the Pastor at a later date and learn more about receiving this blessed and Holy sacracment. However, if you would like to come to the altar for prayer but are not receiving communion, please just indicate this by not opening your hands to receive. Any person who desires to participate in the Sacrament of Holy Communion, but is unable to proceed to the alter, should notify and usher. 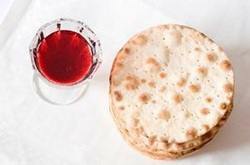 Communion will then be administered at his/her location in the sanctuary immediately after communion is received at the altar by others.